Last week’s Dallas Morning News Offensive Player of the Week Kendial Lawrence rushed for 135 yards on 23 attempts and two touchdowns to lead Rockwall-Heath past Arlington Seguin 24-8 in non-district action Friday night in Arlington. Lawrence scored on runs of 6 and 12 yards to help the Hawks improve to 2-0. Arlington Seguin fell to 0-3. In the hard-fought first half, RHHS only scored on Brad Lowes 31-yard field goal, and held on for a 3-0 lead. But during the second half, the Hawks came alive, when senior quarterback Drew Hollingshead (12-20, 183 yards) completed a 10-yard TD pass to Armando Villa. Lawrence then scored twice, and Lowes added extra points on all three TDs. The game was plagued with mistakes by both teams. 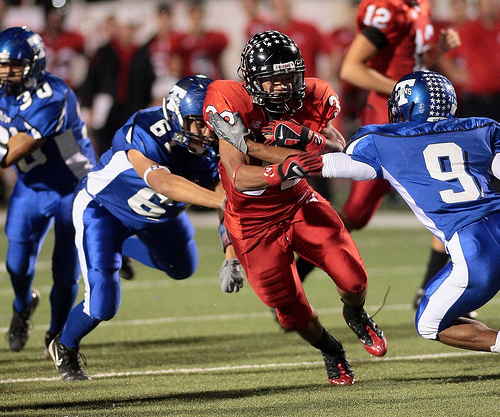 RHHS fumbled seven times, but only lost one. They were also penalized 13 times for 127 yards. Arlington Seguin was penalized 14 times for 155 yards. Rockwall-Heath’s highly-touted running back Kendial Lawrence ran for 190 yards and scored five touchdowns, including a 97-yard kickoff return, to lead the Hawks (1-0) past Sherman (1-1), 43-27, at Rockwall’s Wilkerson-Sanders stadium Sept. 5. In the second quarter alone, Lawrence scored four touchdowns, on runs of 76, 20 and 4 yards, plus his return. By the end of the third quarter, the Hawks held a 43-14 lead. Hawks’ Quarterback Drew Hollingshead also threw for one touchdown, a 63 yard pass to Matt Bielski. He completed eight of thirteen passes for 133 yards. Sherman’s running back Wayman James ran for 110 yards and scored twice. Zac Whitfield also ran back a kickoff 81 yards for a touchdown. RHHS plays their first away game of the season Sept. 12, at 7:30 pm, at Arlington Seguin, which lost its opening game to Wylie Sept. 5, 52-13.